I have purposely ignored all the wrist monitors purely because so many people have a problem getting an accurate reading from them. This is probably not because of the units themselves but more to do with the ease of placing the monitor correctly on the wrist. The cuff monitors are renowned for being generally more accurate because the cuff is placed on a larger area ie. the upper arm and this placement is not quite so critical as the wrist monitor placement. 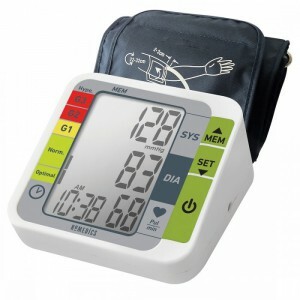 The 4th and last review is for the HoMedics Upper Arm Blood Pressure Monitor BPA-2000-EU which is a mid-range priced monitor. It gets top marks for accuracy and reads quickly. Pros: Very accurate, large clear display and buttons, first rate instructions, easy operation with one button touch. Cons: Quite heavy, only stores one person’s readings, no carry case. This monitor is advertised on the manufacturers website at £49.99 which would be a bit pricey but on Amazon, at the moment it is just £24.99 which seems to be quite a bargain. Although it’s not as heavy as the Omron M7, it’s still quite weighty at 353 grams (305 grams without the batteries). It does score very well for accuracy and offers a range of features including an irregular hearbeat detector. It just takes the touch of one button to start the reading and the monitor will tell you if your blood pressure is in the risk zone. It dates your results and will average them so you can see how your blood pressure is changing over time. It’s very easy to read, an advantage for the visually impaired user. The touch buttons would perhaps be helpful for those with arthritic hands. It gets 5 and of 5 for speed of reading. It will date your results and give an average reading so you can see how your blood pressure is changing over time. Again, the instruction leaflet is very clear and easy to follow. The supplied cuff is for an arm circumferance of between 22cm and 32cm. If your arm size is larger than 32cm, you will have to buy a larger cuff. 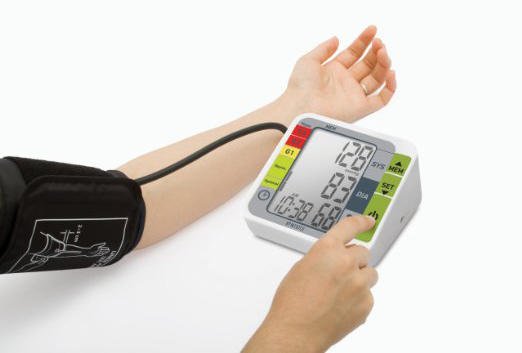 Knowing your arm size would be an advantage before purchasing any upper arm blood pressure monitor. If your arm is not in the range of the one supplied you can buy another size, go to www.homedics.co.uk for details. You will be charged extra for it. The HoMedics monitor does plug into the mains but you will have to buy a separate mains adapter to use this facility. Tip – always look at a blank wall whilst taking your reading, it does help. 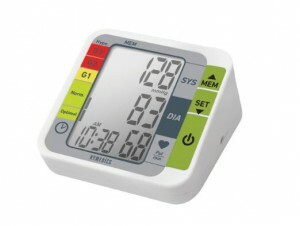 Accuracy is the most important feature of a blood pressure monitor and this monitor gets top marks. Some other cheaper models though, were just as accurate, but at the moment this monitor has been reduced in price!! Each reading is stamped with the date and time and the monitor will average your readings, so you can check how your blood pressure is changing. The size of this monitor is 12cm x 14cm x 7cm high which is quite big and it does weigh 353 grams. It’s not as convenient as the smaller monitors if you want to take it away with you on holiday and it doesn’t have a case. This wouldn’t put me off personally, but it may be an issue for some so I have marked it down a point. Reviews from verified buyers were mostly 5 and of 5 stars, with most reviewers expounding this monitor’s virtues. The which report has put this monitor in the best buy category and a couple of reviewers mentioned this point. Many remarked on the value for money and obviously those purchasers had taken advantage of the reduced price. Accuracy was on the top of the list of most and a few spoke of ‘White Coat Syndrome‘ where blood pressure levels are always higher when visiting the doctors but back down to normal when taken at home on this machine. A lot of purchasers commented on the ease of use and the clear display and the the useful colour indicator which lets you know if your pressure is in the optimal, normal or higher range. Another reviewer said the 4 lithium AA batteries lasted for ages. Nobody seems to worry about the size of the monitor and one person said it made no difference about the lack of a case and recommended it calling it ‘an excellent monitor’. The accuracy of this monitor was pointed out by one buyer who said the HoMedics matched his doctor’s readings exactly which is very gratifying. Amazon reviewers give the HoMedics BPA 2000-EU monitor 4.6 out of 5 stars and I have matched this star rating. If the monitor was being priced at the higher price of £49.99, I would have marked it down a point on the value for money rating. Hopefull the price will stay at this lower price of £24.99. Do not drink, eat, smoke or exercise for half an hour before taking your blood pressure to ensure an accurate result. Sit in an upright position with your arm supported by a table or desk so you apply the correct sized cuff comfortably. Ensure you have the correct cuff for the size of your arm. Wrap the cuff around your arm, about 2cm from the elbow joint with the rubber tube coming out centre front. Adjust the tightness of the cuff with your free hand and test that you can get 2 fingers under the cuff. Always apply the cuff next to your skin. Sit upright with your arm at the same level as your heart. After fitting the cuff, rest for 5 minutes before pressing the on/off button followed by the start button. 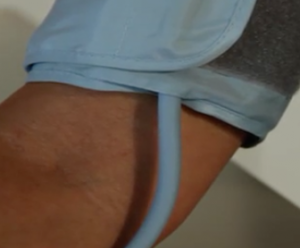 The monitor will start your test by expanding the cuff and then slowly releasing the pressure to get the reading. Take sets of 2-3 readings twice a day, in the morning before bp medication and then 12 hours later. Repeat the process over the course of several days. Try and keep to the same time each day and use the same room and place of testing each time. Keep a record of your bp measurements taking note of dates and times. This is useful especially when taking bp medication. Don’t change your medication without consulting your doctor first. Your comments and observations would be welcome, don’t be shy, you will be helping other consumers to make an informed choice. Hi there Robert, to buy from my site click on the model in red which is the link to Amazon in the UK, but I am sure you can buy this bp monitor from Amazon in other countries, including the US.